Laban agreed with Jacob and he went back home. Jacob is very witty. He took the branches from the green poplar, almond and chestnut trees. Jacob then peeled the branches so that it will show the white in the branches. To attract the speckled and spotted lambs, Jacob put the peeled branches (which are exposed in white now) in the watering troughs where the not spotted or speckled lamb and brown lamb came to drink when they are in heat. The spotted and speckled lamb mated with Laban’s brown lamb which is stronger and healthier. And so all the lamb that is given birth are spotted and speckled. Jacob then took these lambs into his own flock. Jacob will never allow the weak ones in Laban’s flock to mate with his spotted and speckled lambs. And so Jacob becomes rich and own large flocks, camels, donkeys as well as male and female servants. Laban’s sons began to notice and envy Jacob because Jacob has become very rich. Jacob also notices that Laban is not very friendly to him recently so he decided to move back to his father’s home at Canaan. Jacob spoke with his two wives, Leah and Rachel about it and they agreed with Jacob that they should leave. So Jacob took his wives, his sons along with all his flocks, and possessions and set out for Canaan. 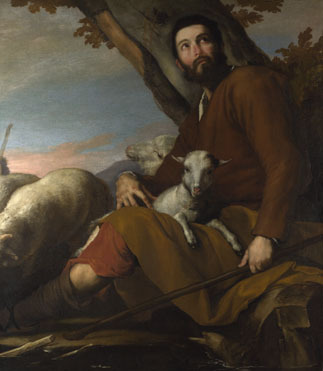 While Laban went to shear his sheep, Rachel stole one of the household idols of Laban. Jacob was attempting to flee from Laban because he didn’t inform Laban about his departure. When someone told Laban that Jacob had fled, he took a few men with him and chase after Jacob for seven days. Then Jacob went through Laban’s tents but he couldn’t find it. Now Rachel hid the idol in the camel’s seat in which she was sitting. Rachel told his father, Laban,” Excuse me. I couldn’t get up because I am having period.” So Laban never found the idol. So Jacob took a stone set it up as a pillar. Laban called the pillar of stone Jegar Sahadutha. Jacob called it Galeed because it serves as a witness between him and Laban. Laban also called it Mizpah because he said that it is a witness that God will watch over between him and Jacob when Jacob is absent that he will never harm my daughter or take other wives besides his daughter. Jacob offered sacrifice to the Lord and called the men to eat bread.